What does it mean when a player stands up after making a big bet? Zachary Elwood (Reading Poker Tells, Verbal Poker Tells) closely examines this behavior as demonstrated in past years’ World Series of Poker events. What does it mean when a player makes a big bet and then stands up? We’ve seen it many times in World Series of Poker footage and in other tournaments. A player shoves all in and then stands up as he waits for his opponent to act. Maybe he paces around. Maybe he talks a bit. Maybe he just stands and stares silently at the board. It certainly heightens the drama of such moments, but is there perhaps something more to consider from this behavior? Is Yang standing up because he has a strong hand and is relaxed? Is his standing up a release of anxiety and nerves due to having made his decision and recognizing his fate is now out of his hands? Is there any general meaning we can draw from the mere fact that he stands up after betting? That’s a hard question to answer with one response, so we’ll break it down into a series of questions. And we’ll look at some more footage of WSOP players standing up in different situations. First, let’s get clear about the specific behavior we’re talking about. We are talking about what I call post-bet behavior, meaning that the standing-up behavior comes after the player has made a bet. (We might also be interested in standing-up behavior that’s associated with a bet, so it might come during or even a bit before a bet, but here we’ll mainly be focused on post-bet standing.) To reiterate: we are not considering players who stand up without having made a bet and who are waiting for an opponent to act. In many cases that standing up will be done defensively. Second, let’s also assume we’re talking about big bets. It’s pretty rare to see someone make a small continuation bet and then stand up (although that would be a lot of fun to see). Most of the standing up comes about due to big and potentially exciting situations, and most of those are all-ins, so we’ll be focused on big bets. Players who’ve made large bets and who move around more will tend to have stronger hands on average. Players with strong hands are relaxed and usually unconcerned with opponents studying them, and therefore will be more willing to do strange things (like standing up). 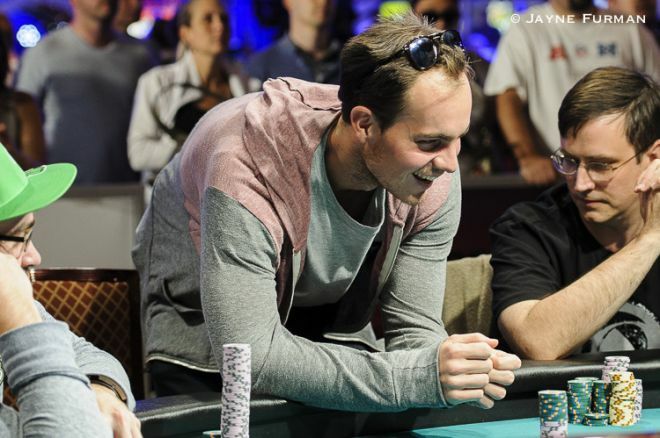 Players who’ve made large bluffs will tend to be more still. Bluffers tend to avoid doing unusual things because they don’t want to be studied. In a vacuum, then, the general rule should be that players who stand up after betting are more likely to be relaxed and have strong hands. This makes sense logically, and does fit in with a lot of other general “unusual behavior” patterns. In the first hand we looked at, where Jerry Yang stood up after shoving on the flop, he had in fact flopped a flush. This is how a lot of post-bet standing shows up: from players who are relaxed. But let’s now go into some more detail to see if we can understand how this behavior shows up in other circumstances and see if there’s more or less reliability in these different situations. What does standing up after a preflop bet mean? Even though I think standing up preflop will fit the general pattern and be skewed towards stronger hands, it’s hard to find too much meaning preflop. This is because preflop hand strength is so undefined in general. Because hand strength is so ambiguous preflop, most players are pretty ambivalent about their hand strength until the flop comes and defines their hand more. For example, a player might feel very similar raising preflop with many different hands, such as or or -suited. Most preflop hands are not worth getting either excited about or nervous over. The main exceptions preflop will be with , , and sometimes (and sometimes when short-stacked). These are generally the only hands players desire to get action with after making their preflop bets. For this reason, there’s not a lot of meaning to be found from preflop post-bet standing up, in general. This explains why there are a lot of examples of players standing up after shoving preflop with all sorts of hand strengths. Here are a few examples to show you some of the variety. The examples start with weak-hand examples and bluffs and move to medium-strength and then to strong hands. When considering an alternative reason for why players with weak and medium-strength hands might stand up after betting, it might be due to a release of anxiety. They have made all their decisions and are awaiting their fate. This might help explain some of these situations. Another alternative explanation for some of this behavior could be that some players (especially better players) may know that standing up after betting seems relaxed and so some try to replicate this behavior when they hold weaker hands, in order to try to get folds. I think this may sometimes be a factor preflop — that hand with Scotty Nguyen is probably a case of that. And it definitely becomes more of a factor in some instances of later, postflop standing-after-betting. Mainly, though, I think the ambiguity of preflop situations just leads to more behavioral variety in general. Players genuinely don’t care as much about the situation. I think the general pattern (standing up meaning strength) is much more reliable postflop, due to hand strength being so much more defined. Going through my database of postflop examples of post-bet standing up from the WSOP (and from other tournaments), almost all of the examples were from players with strong hands. This is an admittedly biased selection of hands, obviously. One reason is because big bets in general will tend to be made with strong hands. Another is the fact that when it comes to televised hands, ESPN often chooses to show those with a high drama-level, which probably also makes strong hands more likely. But I still think the high number of examples of standing-up-when-strong indicates something meaningful, especially when you factor in that big bluffs provide even better drama than big value bets, suggesting those editing the footage would have a motivation to include as many big bluffs as they could. Before we conclude, however, it’s worth pointing out a few caveats and warnings. First caveat: some players are consistent in their behaviors, while other players will tend to stand up often and be balanced with how they stand up. (And some players will be very imbalanced and be much more likely to stand up after betting strong hands than weak hands.) So, as with all behaviors, the best way to make use of this behavior is to have a sense of how reliable it is for a specific player. Another caveat is that there may be a good reason for standing up. Maybe you have an immense amount of chips that it’s rather difficult to move forward. This would make it more likely you’d have to stand up to be able to push your chips in. This was in fact the case with Jerry Yang during the 2007 WSOP, as he had accumulated so many chips he found it rather hard to move them around. Besides that, I think it was just Yang’s general style and habit to stand up to bet — I’ve seen other players who often stand up to make bets. Because these players do it often, in many different situations and with many different hand strengths, there probably isn’t much information to gain from their behavior. This brings us to a third important caveat. In tournaments (which are the types of games in which you’ll most often see bettors standing up), you usually won’t have much of a sample size on your opponents. So it’s debatable how often you’ll feel confident basing a decision on this behavior. My database of logged hands is pretty large, with thousands of hands in total, and hundreds from WSOP events. I could only find one instance of a pure bluff from a player who stood up after a postflop bluff (excluding players like Jerry Yang who often stood up when betting, and also excluding some hands that were low-to-medium-strength but not clearly a bluff). This is why I included another hand from a European Poker Tour event to emphasize the point that of course, you can never be certain of anything. Although it’s hard to draw firm conclusions about this behavior for a few reasons (small sample size and possible bias in chosen footage), I’m confident that standing after making a bet is significantly more likely to be associated with relaxation and strength, and that it’s a much more reliable indicator in postflop, big-bet situations. The conclusion makes logical sense and it holds up well when studying the footage.